It happened on April 1 — April Fools’ Day. It is a quasi-notable pranking date on the Western calendar but it seems unlikely it meant anything to the Egyptian guys in the housekeeping department of the Nile Commodore. 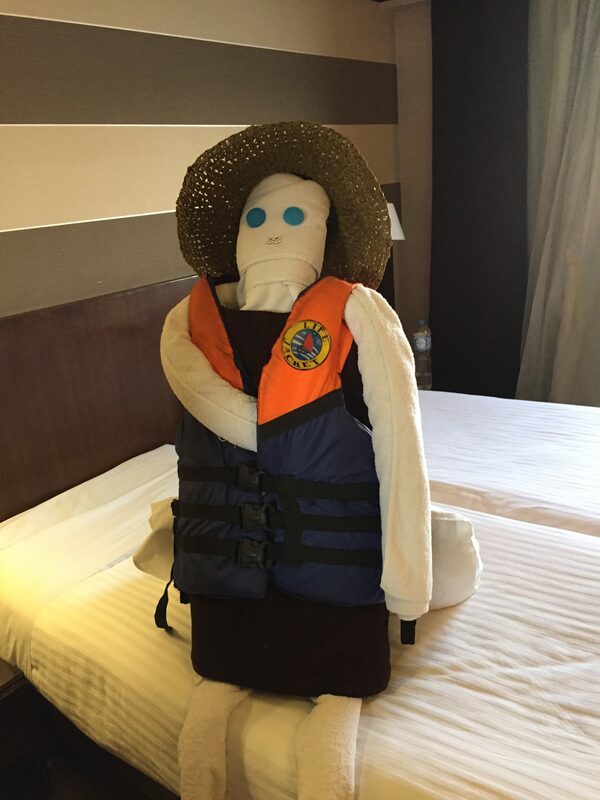 They like to create works of art out of items they find in each stateroom. And it could be any day of the year. Which led to the cleverly crafted “person” sitting on the bed in nearly every berth on the ship, which scared to death more than a few tourists who entered darkened rooms, with shades drawn, and found a life-size figure waiting for them a few feet away. The centerpieces of their inspirations come from bulky items found in each berth — towels, pillows, a bedspread, a life jacket. The eyes on the creatures tend to be made with blue water-bottle caps. At a glance, a distracted tourist returning from a visit to an ancient temple … can make the mistake of seeing an interloper. When it is only a lot of laundry, skillfully arranged. We have been gifted with three designs in the past week. One was made to look like a palm tree next to a hand-towel teddy bear wearing glasses and a cap. Another was a crocodile based around a big, thick bedspread, with a gaping mouth propped open by a packet of tissues. The invader in the life jacket, above, was the cream of the crop. Once the visitors got over the initial shock, it seems at least possible that bigger tips will be left behind by the tourists when they disembark. Some artists lurk among the crew.